Some of the efforts from the last few weeks, all from life and a few drawings thrown in for the good measure - I've been neglecting basic drawing for a while and need to redress that so am trying to focus more when doing the warm ups. I am also experimenting with reducing the tonal range on some of these, I dont always have dramatic light to work with and I am also interested in a bit more subtlety both on these quick studies and also in other longer pieces. 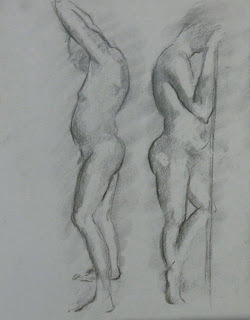 The larger studies are about 1.5 hours and the small ones 45 minutes approximately. Oil on Arches paper 12 x 16"
Oil on Belle Arti canvas pad 12 x 16"
Oil on Gessobord 9 x 12"
Oil on Gessobord 5 x 7"
Oil on gessobord 6 x 6"
Nice work Tina ! I like the male paintings first two , ...good work ! Thanks Sandra, I keep plugging away. Hope you are good. Love the weighty male paintings - well done! Thanks Susan, he's a great model and it was a good session.